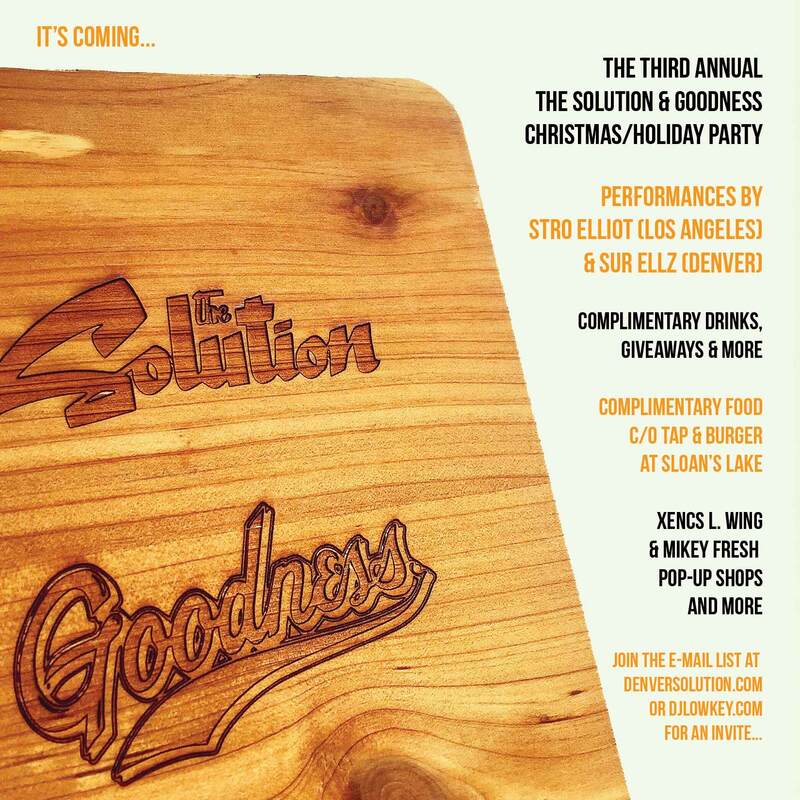 Friday, 11/30 -> The Solution w/DJ Low Key & Lazy Eyez welcomes back Sur Ellz from LA! 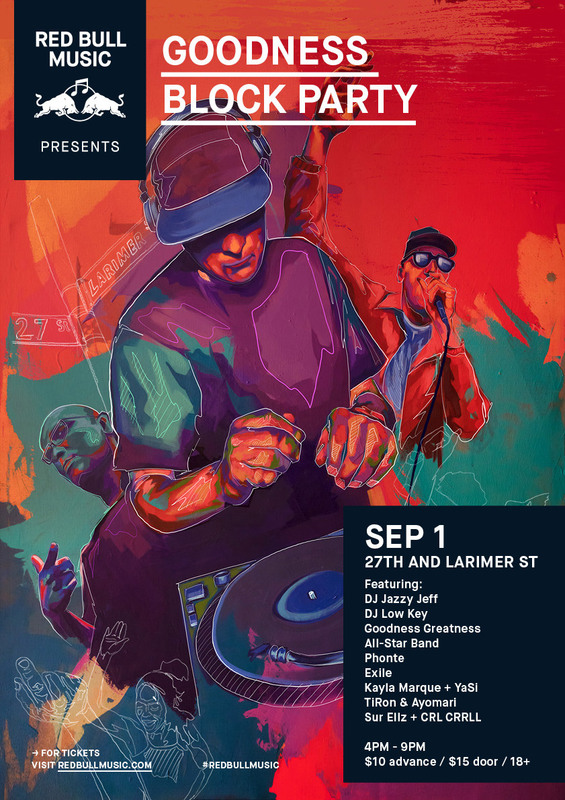 New music premiers from a Denver favorite, photos by IG: @Armando_Geneyro & more at The Black Box!!! 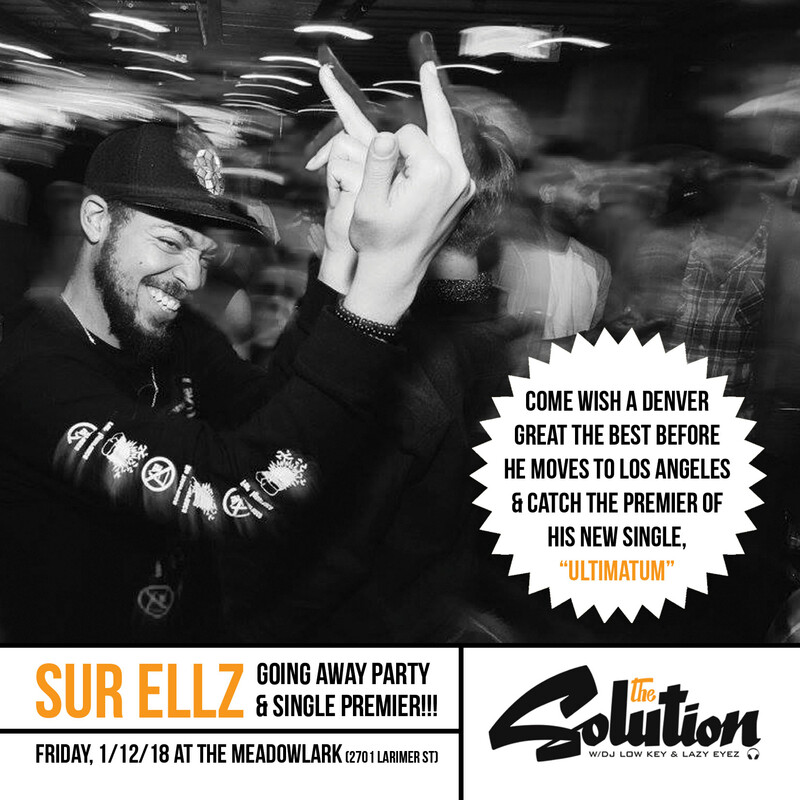 Friday, 1/12 -> Sur Ellz Going Away Party & “Ultimatum” Single Premier at The Solution w/DJ Low Key & Lazy Eyez!!! 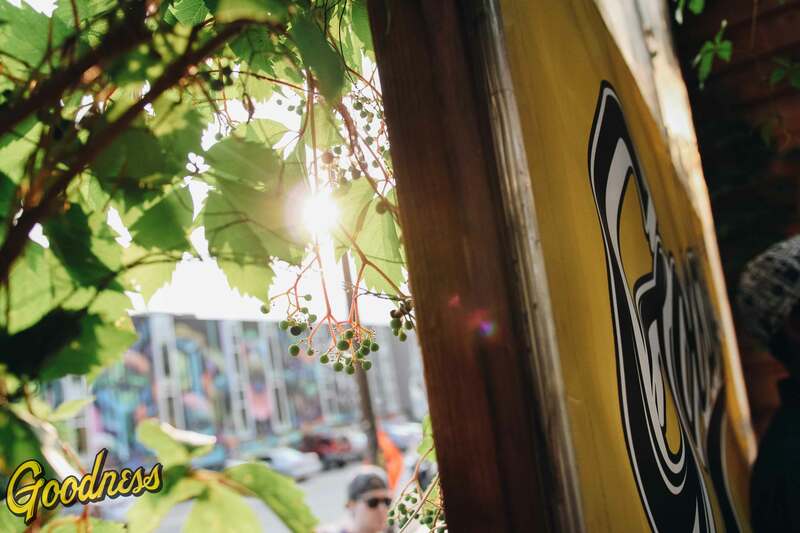 Photos by IG @Armando_Geneyro, all the best in hip hop & lots more at The Meadowlark! 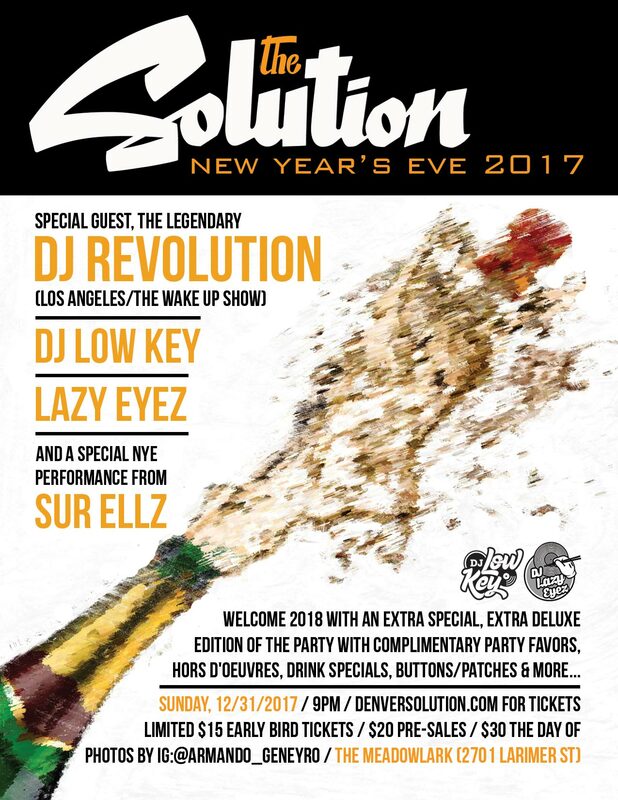 Sunday, 12/31 -> The Solution New Year’s Eve 2017 w/special guest, the legendary DJ Revolution, DJ Low Key, Lazy Eyez & a performance from Sur Ellz! Photos by IG: @Armando_Geneyro, complimentary party favors, hors d’oeuvres & lots more at The Meadowlark to bring in 2018 – limited discount pre-sale tickets available now!!! 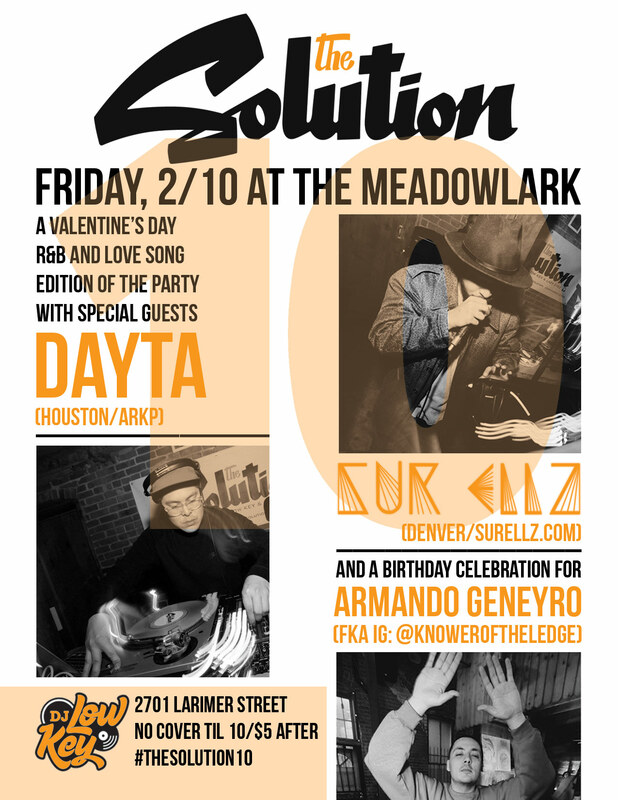 SUNDAY, 12/31 -> Make your way into 2018 properly at The Solution w/DJ Low Key & Lazy Eyez with one of the best DJs of all-time, the legendary DJ Revolution (LA/The Wake Up Show) joining us on the turntables, a performance from Denver favorite Sur Ellz & more surprises at The Meadowlark (2701 Larimer Street)! Saturday, 10/1 -> Ink Monstr Sticky Situation, a sticker art show w/host Redman, Royce Da 5’9″, Sur Ellz, DJ Low Key, live painting, art by some of the country’s top artists & lots more at Exdo Event Center! No cover all night long!! !